An Addictive Drums kit can contain up to 12 instruments, but they are always in the same configuration, so it's not possible to have more than one kick, snare or ride cymbal. Is it really necessary to give up an entire hard drive in order to get your hands on a good-sounding drum library? XLN Audio think not. When I got my first laptop computer, I naively looked forward to a life of unfettered musical freedom. At last, I thought, I could make music anywhere, without a care in the world. All I needed was a pair of headphones and a controller keyboard. Oh, and an audio interface. And a USB hub for all those copy protection keys. And a power supply for the USB hub. Oh yeah, and cables to connect it all together. Suddenly, music-making with a laptop didn't seem quite so free or spontaneous, and it was about to get worse. I thought it would take me ages to exhaust my 60GB system drive, but I could have filled it three times over just with drum sample libraries like BFD and DFH. Clearly, an external hard drive was another must-have for the modern-day musician on the move. And a power supply for the external hard drive. And cables, and... I might as well have got a desktop PC, really, because the only thing I was going to get out of taking this lot on a long journey was a hernia. So thank heaven for Digidesign's Strike, which squeezes its numerous kits into a relatively economical 6GB of compressed data, yet still sounds fantastic, and thank heaven for XLN's new Addictive Drums. 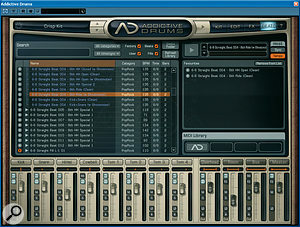 At well under 2GB in size, Addictive Drums could find a home on even the most crowded hard drive, but it still provides a very comprehensive set of drum samples and processing options, thanks to a proprietary data-compressed file format that makes use of variable bit depth to avoid wasting disk space. 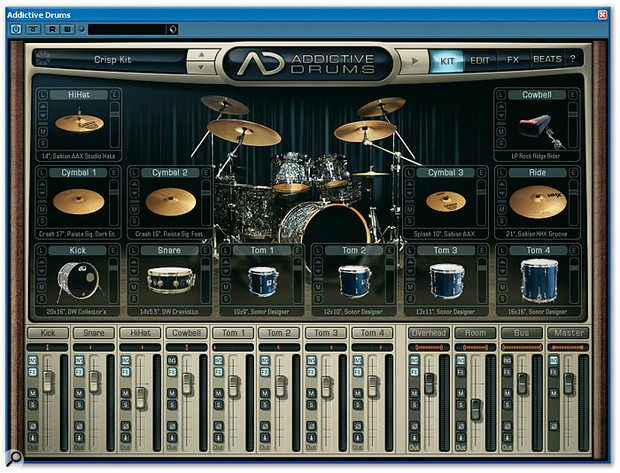 Addictive Drums is available for Mac OS X, including Intel Macs, and Windows, and supports the VST, RTAS and Audio Units plug-in protocols. Installed from a single DVD, it's authorised by a simple challenge-and-response process where you type your serial number into XLN Audio's web site. Once you've done that, you simply load Addictive Drums into the appropriate bit of your host application and away you go. Most of the basic concepts behind the Addictive Drums interface are familiar from other products, but the way they're implemented here is uniformly slick and usually pretty intuitive. There are four main pages. The Kit window is where you assemble drum kits from the individual drums that have been sampled by XLN Audio, while switching to the Edit page allows you to make detailed changes to the sound of any individual drum. 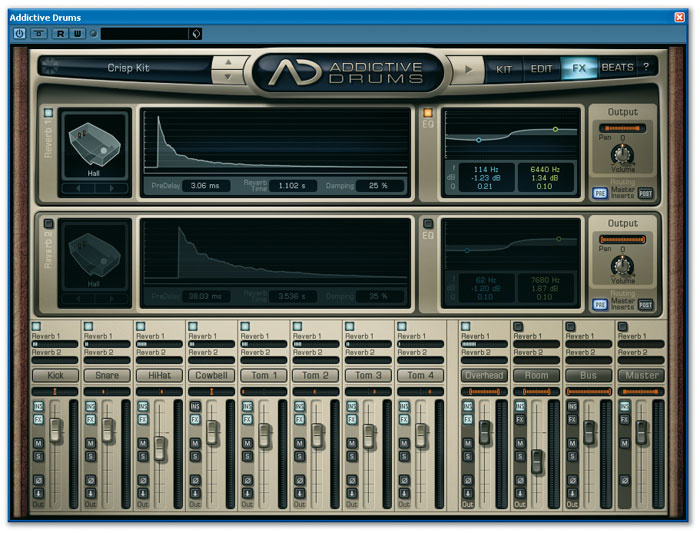 Processing available in the Edit page includes a variety of insert effects, but there are also two global reverb generators, which have a separate editing window. The fourth page, Beats, is a file browser that allows you to search and audition a library of over 3000 MIDI grooves. When you've found one you like, you can simply drag and drop it into the Arrange page of your host sequencer. There are two simple global reverbs.Beneath the main window is a mixer, which is permanently in view. This has separate mono channels for each drum, the cowbell and the hi-hat, plus stereo overhead and room mics. It also provides a single stereo bus to which you can route any number of the mono channels for group-based processing, along with a master stereo bus. Every channel has sends to the two reverbs, plus the mute, solo and phase buttons you'd expect, and all the channels are available on separate outputs in host applications that support this. The pan controls on the stereo channels are worth a mention, too, because they typify the attention to detail that has gone into XLN's interface design. Clicking and dragging from side to side does exactly what you'd expect, while clicking and dragging up and down keeps the overall left-right balance the same, but makes it narrower or wider. Neat. All of Addictive Drums ' kicks and snares are sampled using two close mics — in front and on the beater side for kicks, above and below for snares — but the balance of these two is determined in the kick and snare Edit pages, so as far as I can tell, there's no way to reverse the polarity of the bottom snare mic while leaving the top mic unaffected. XLN say that they've edited the room and overhead samples so that they're exactly in phase with the close-miked samples, but it's possible to delay the Room channel by up to 50ms, which can help increase the apparent amount of ambience. One reason why Addictive Drums is such a comparatively slimming meal for your hard drive is that XLN haven't sampled the spill from individual drums into other drums' close mics. Nor have they included samples from talkback mics, or PZMs on the floor, or contact mics taped to the drummer's skull, and I can't say I miss them. Like Strike, Addictive Drums loads its samples into memory rather than using disk streaming, and XLN say that a full kit takes up around 350MB. However, it differs from Strike in that there is only one level of preset saving and loading. You can't, for example, save separate kit and mixer presets, or store just the effects processing you're using: here, it's all or nothing, although it is possible to copy and paste Edit page settings from drum to drum. The Edit page allows you to adjust sampler settings and insert effects for individual drums and mixer channels.When you hook up your MIDI keyboard, you'll find that XLN have sensibly departed from GM convention to map most of the instruments across multiple keys. This is necessary, because all of the instruments apart from the kick and cowbell have been sampled being hit in a number of different ways. With snare drums, for example, you get separate left and right open hits and rimshots, plus rim clicks, sidesticks and 'shallow hits', all mapped to separate keys. There are no fewer than 12 different hi-hat strikes, and these are sensibly set up so that, for instance, you can use two fingers to alternate between hits made with the tip and the shaft of the drum stick. As you'd expect, the hi-hat pedal is set up to choke the open hat samples; more unusual is the inclusion of separate choke samples for the crash and ride cymbals (ie. samples of the drummer actually catching the cymbal to damp it). These are a nice touch, and much more natural than simply fading or cutting off a crash cymbal when you want it to stop. XLN have managed to fit a good variety of drums into their library, and despite its modest size, everything is sampled flawlessly, with plenty of alternating samples in each velocity layer, and a smooth progression in timbre and loudness across the MIDI velocity range. There are four kicks, six snares including a piccolo, three sets of toms which can be mixed to taste, four rides, three hi-hats and a total of 14 other cymbals. Together, these make it possible to construct a fairly wide range of kits, but Addictive Drums has a fairly consistent aesthetic which emphasises power and punchiness; for instance, all four of the kick drums sampled are meaty, large-shelled models with bottom end to spare. You could find a place for these sounds in almost every variety of rock music, but it might be more of a struggle to make them work in a jazz track, for example. Of course, no instrument can be all things to all people, and XLN Audio say that they plan to create add-on packs in other styles, which will include more jazz-oriented kits such as a brushed kit. 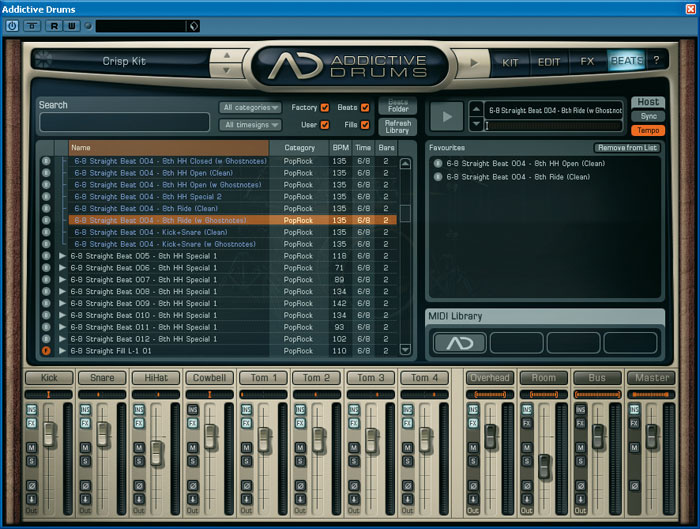 The last of the four main pages in Addictive Drums is Beats, which is where you look for a suitable MIDI drum part for your song among the thousands supplied. Everything you can see in the browser is clearly named and tagged with useful information such as intended tempo, length in bars, musical style and time signature. Most of the MIDI patterns consist of a basic Beat or Groove and up to 20 or so variations on it; only the basic pattern show up in the browser, which helps to keep the list down to manageable proportions, but if you want to expand them to see what variations are available, you can click on the white arrow to their left. The distinction between Beats and Grooves is fairly arbitrary, but the idea seems to be that Beats represent more basic bread-and-butter drum parts, while Grooves are more sophisticated and complex. As well as more than 130 two-bar Beats and over 100 four-bar Grooves, there are also a number of complete drum arrangements which you could use as the basis for entire songs. A well implemented text-based search facility, plus filters allowing you to search only certain musical styles or time signatures, makes it easy to find what you're after. When you have a pattern selected in the browser, clicking the large arrow icon at the top right auditions it either at its preferred tempo, or if the Host Tempo button is selected, at your song's tempo. There's also a Sync button that starts and stops playback of the selected MIDI pattern along with your sequencer's transport, but this seems a little pointless, since there's no way to trigger pattern changes over MIDI; so if you find a pattern you like and want to use it in your song, you need to import it onto a MIDI or Instrument track in your sequencer. Fortunately, this involves nothing more complex than dragging the pattern out of the Addictive Drums window directly into your sequencer's Arrange page. Alternatively, you can drag it over to the Favourites window on the right-hand side, which is handy if you're trying to build up a shortlist of possible grooves for your song. My only gripe here is that there doesn't seem to be a way to empty the Favourites panel in one go; instead, you have to select and Remove each pattern individually. The Beats section is one area where the PDF manual is a little light on information, and when I first tried dragging patterns into a Cubase arrangement, I was a bit puzzled to hear the song tempo suddenly jumping around. It turns out that the MIDI files include tempo and time-signature information which gets converted into events on the Tempo Track. It's possible to import your own MIDI files into the Addictive Drums library, but this is one area where XLN's usual slickness has deserted them. I had hoped it would be possible to simply drag and drop MIDI Parts from the Cubase Arrange window, but it isn't. Instead, you need to export them from your sequencer and copy them into the User MIDI Files folder. If you want to treat some of them as variations of others, or assign them to a musical style, you'll also need to rename them according to some rather inscrutable conventions. Finally, you need to Refresh the MIDI Library before they'll appear in the browser, which takes a few seconds. I don't think I'll be developing my own library of Addictive Drums Beats any time soon, then, but I found the factory patterns very usable. The theme-and-variations concept works well, and the basic beats cover a wide range of styles in enough detail that you're sure to find something you like. I was particularly pleased to see a good collection of 3/4 and 6/8 patterns. In many cases, you could string together a fairly convincing song arrangement just by using variations on a single Beat, and if not, you can always edit the patterns in your sequencer. Because they're MIDI patterns, they don't have the same level of realism as the performances in Digidesign's Strike, which are based on live playing. Nor does Addictive Drums offer anything comparable to Strike's 'virtual drummer' engine, which allows you to create a realistic performance simply by moving a couple of sliders as the drum part plays back. However, the flip side of that is that the variety of styles on offer here is far greater. Hitting one of the buttons at the top of the mixer channels takes you to that channel's Edit page (see screen above), which is roughly divided into two horizontally. The top half shows the sampler settings used to play back that instrument, while the lower half makes available a selection of insert effects and gives you the chance to balance the two mics used for kick and snare drums. 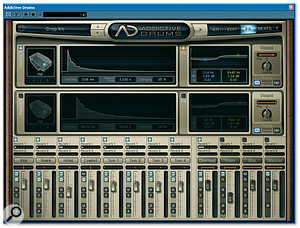 The sampler settings allow you to control the relative levels of your chosen instrument in its own channel and in the overhead and room channels; so, for instance, if you wanted to create a very dead drum mix, you could turn down the room and overhead levels for all of the individual drums, and treat the overheads just as close mics for the cymbals. Alternatively, you could mute all the close mics in the mixer to get a very ambient drum sound. It's a simple but flexible system which works nicely, and makes it easy to keep the kick fairly dead whilst having the rest of the kit fairly live-sounding, if that's what you want. The sampler also provides straightforward pitch and volume envelopes, which can be used either for subtle trimming and tightening or more extreme effects, and a simple non-resonant filter. Settings made using these controls apply to the instrument as it appears in the room and overhead mics, as well as in close mics. The Snare channel features a Buzz control, which makes it resonate in a realistic fashion when you trigger a kick or tom-tom. By contrast, the insert effects apply only to whichever mixer channel you're editing, so the snare sound in the overheads will still be clean even if you get brutal with distortion on the snare channel in the mixer. The insert processors always come in the same order — compressor, distortion, EQ and output saturator — with the Bus and Master channels adding tape emulation and filtering before the output saturator. All the effects are child's play to set up and use, and give you just the right balance of flexibility and simplicity. I don't know how authentic the tape emulation on the Master channel is, but it makes a highly effective loudness maximiser, while the four flavours of distortion on offer run the gamut from subtle thickening to bit-crushing mayhem. The FX page (see screen on previous page) is devoted to settings for the two reverbs, which are equally simple to operate. There are four basic algorithms covering the standard hall, plate, room and ambience bases. Editing in each case is restricted to settings for pre-delay, reverb time and damping, and there's a simple two-band EQ. Part of the appeal of this sort of instrument is the natural ambience that's captured on the Room channel; these simple reverb generators offer nothing like the same degree of realism, but they're fine for special effects, or if you want to make the snare a bit more obviously reverberant than the room mics allow. The output of the reverbs always goes to the Master channel, but you can choose whether it is fed in before or after any Master inserts. 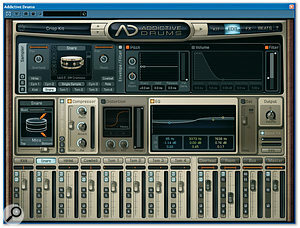 As ever, exploring the presets is a good way to get a feel for what Addictive Drums can do, and the answer is 'a lot'. Loading kits is not instantaneous, but it's fast enough that browsing the presets doesn't become a chore. I've already mentioned that the basic kit samples pack plenty of power, and the presets develop this in a variety of directions. There are some very tasty dry kits, many of which use filtering and envelopes to sculpt sounds that are dead yet still punchy. At the other end of the spectrum, there are some epic stadium-rock setups which aren't to my taste, but could come in handy if a madman forces you at gunpoint to recreate REO Speedwagon's Greatest Hits. The 'Lofi', 'Distorted' and 'Electronica' banks showcase the ways in which insert processing and repitching can be used, and there are some fairly convincing '70s sounds lurking in the 'Retro' bank. Because everything is loaded into RAM, it's a very responsive instrument to play. Both the basic samples and the preset kits make excellent starting points for creating your own drum sounds, and I'm very impressed with how easy it is to do just that. In this instrument, XLN Audio have tried to combine the sort of realism and versatility we expect from modern drum sample libraries with slick interface design and modest system requirements, and I think they've got the balance spot-on. There are enough microphone choices and mixer channels to match most real-world drum recordings, but not so many that you get lost. Perhaps the fact that you can't hear hi-hat spill in the cowbell mic detracts minutely from the realism on offer, but if the alternative is a 30GB installation and 40 channels of sample data streaming from disk, it's a sacrifice that I, for one, am more than happy to make. There are plenty of good drum instruments out there, but the field is a bit narrower if you don't want your entire hard drive taken over. Digidesign's excellent Strike features a highly sophisticated 'virtual drummer' engine as well as a high-quality sample library, but is only available to Pro Tools users. Of the rest, Toontrack's EZ Drummer is perhaps the most obvious competitor to Addictive Drums. It too comes with a huge library of MIDI grooves, but unless you buy the optional expansion packs it's restricted to a single drum kit. Good basic sounds, with plenty of power on offer for rock styles. Lots of alternate samples and good response to MIDI velocity make it easy to avoid machine-like drum parts. An excellent library of MIDI patterns, with a neat browser to find the one you want. Enough mixing and processing options to be flexible, but not enough to be confusing. The full installation is under 2GB. Adding your own MIDI patterns to the library is a pain. It's not possible to have more than one kick, snare or ride cymbal in a kit. 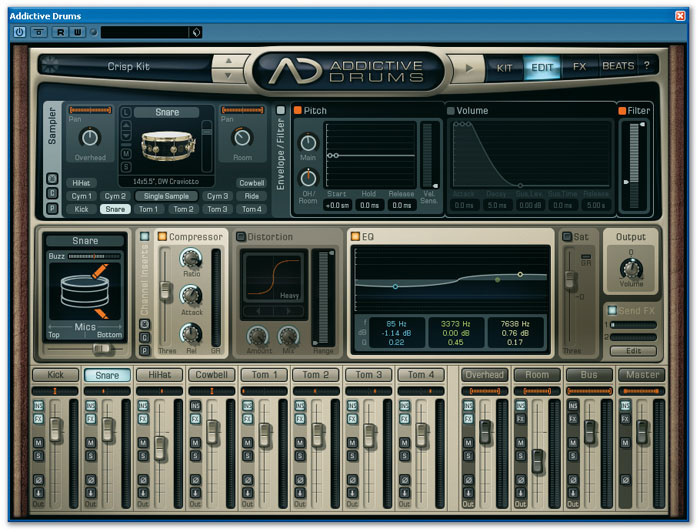 Addictive Drums is a superbly thought-out and very playable drum instrument which sounds good, is easy to use, and won't take over your hard drive.